Kiss Monster Mini Golf at the Rio Suites features a glow-in-the-dark indoor golf course, arcade games and a DJ. 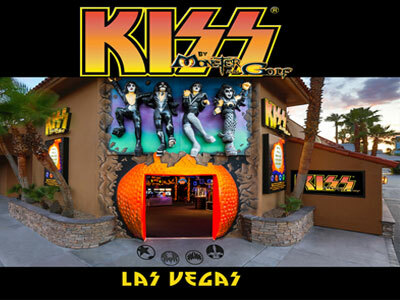 The course features day glo murals and video displays of Kiss concerts! Check out the high boots, the electric ax guitars and the signature Kiss make-up. 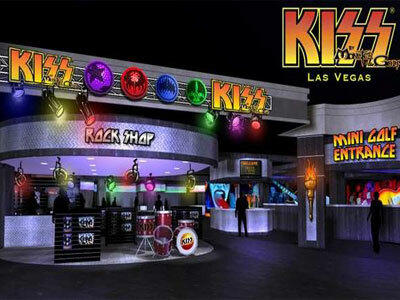 Enjoy the life-size animatronic Kiss band near the end of the 18 hole course. Peruse the hundreds of pieces of memorabilia that are on display, including the Porsche gifted to drummer Eric Carr when he signed with the band! We had a great time here! The prices were reasonable. It’s all indoor and you glow in the dark. There are drinks and food available. The place could look a little newer, but we had fun. Check it out!